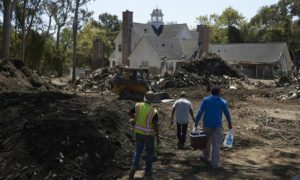 After wildfire and mudslides ravaged Montecito, the little California town had at least one consolation: the trauma united the community. Everyone had suffered in some way. Flames scorched the hillsides last December in the biggest wildfire in California’s modern history. Weeks later torrential rain unleashed huge mudflows, killing at least 21 people, destroying dozens of homes and forcing thousands to flee. “We’re going to come together and do what great Americans do all the time. We’re going to help each other,” said Oprah Winfrey, one of many celebrity residents. Now, three months after the mudslides, normality is returning. Roads and businesses have reopened. Insurance companies have started paying some of the claims totalling $421m. Tourists are back. The town’s carved, hand-painted street signs are being repaired. “Signs of recovery,” the Montecito Journal declared on its front page last week. One segment of the population, however, is struggling to recover: the largely Latino service workers – maids, nannies, gardeners, caregivers, cooks, waiters, busboys – who earn near minimum wages and live in the shadows, paycheck to paycheck. Many recently returned to work after enforced layoffs and discovered they would not be paid for any lost time. “Not a cent,” said Zita Nevarez, 38, a barista and single mother who lost six weeks of work. She was unable to pay rent or her daughter’s school fees. “I had hoped for some compensation from my employer, some help, but nothing,” said Serafin Torres, 45, a maintenance worker who lost seven weeks. He has kiboshed a plan to buy a computer for his children. Angelica Garcia, 30, a florist and single mother, could not pay utilities after losing three weeks’ salary, resulting in her gas and electricity being cut off. “I have three children. It was very difficult,” she said, tears welling. Few such workers have spoken out publicly, to avoid antagonising their employers. However, a handful spoke to the Guardian on condition the employers not be identified. Another reason some are unwilling to speak out: they are undocumented and fear deportation. Lacking legal status also bars them from seeking emergency relief from the Federal Emergency Management Agency (Fema). The solidarity is no myth, though. Some businesses have paid full or partial salaries for lost weeks. Residents have also helped workers, who tend to live out of town, by establishing a fund gifting individuals up to $600. It has raised tens of thousands of dollars. Nevarez, the barista, received $500. “A huge help, more than I expected,” she said. It helped her catch up on rent and school payments. Cause, with other not-for-profit groups, including MICOP and Future Leaders of America, has launched its own fund to help some of the estimated 126,000 undocumented immigrants in Ventura and Santa Barbara counties affected by the wildfires and mudslides. It has distributed $359,500 to people like Torres and Garcia and seeks an additional $2.4m. However, the fire and mudslides had greatly strained poor families who were struggling even before the disasters, Romo said. “Their needs have far exceeded our resources for many years.” The inability of undocumented people to access some government assistance posed further challenges, he said. Montecito, which means “little mountain” in Spanish, is busy rebuilding. Landscapers are repairing and replacing damaged eucalyptus, juniper, pepper and pine trees, which ring many properties. Realtors, interior decorators, kitchen designers and wealth planners are pitching for contracts.